What are the Dividend Champions? Similar to the Dividend Aristocrats, the Dividend Champions is a group of stocks whose current streak of providing annual dividend hikes is at least 25 years. The main difference between the two groups is that Dividend Champions must meet the sole requirement of having at least 25 consecutive annual dividend boosts. Unlike the Dividend Aristocrats, the Dividend Champions do not have to be included in the S&P 500 Index and do not have to meet the minimum market capitalization of $3 billion. On the most recently available Dividend Champions list, as of December 1, 2018, the smallest company included had a market capitalization of just $247 million. Due to fewer requirements, the current Dividend Champions list includes more companies than the Dividend Aristocrats list. The Champions list includes all 53 Aristocrats, as well as 77 additional companies that do not meet the additional requirements set out for Dividend Aristocrats. David Fish developed the Dividend Champions list and first published the spreadsheet in December 2007. 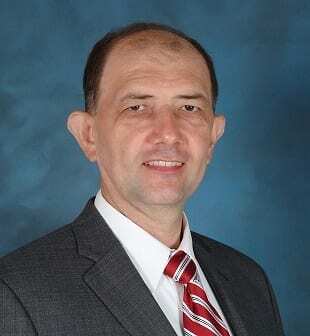 In addition to developing and maintaining the U.S. Dividend Champions spreadsheet for more than a decade, Mr. Fish was a long-time contributor to Seeking Alpha and other online financial outlets. After Mr. Fish passed away in May 2018, Justin Law took over the task of managing and publishing the Champions list. The most recent list – updated through November 30, 2018 – is available on the DRiP Investing Resource Center’s website. This webpage also provides a link to the archive of every monthly report back to December 2007. In addition to the main list of Dividend Champions, the list also includes separate lists of Dividend Contenders – companies that have increased their annual dividend payouts over the last 10 to 24 years – and Dividend Challengers – companies that have increased their annual dividend payouts over the past 5 to 9 years. In addition to the 130 Champions, the current list includes 200 Contenders and 535 Challengers for a total of 865 companies across all three lists. Investors desire equities that pay dividends because dividend payouts provide investors a relatively steady and reliable source of income. Generally, dividend distributions are nothing more than a simple transfer of a portion of the company’s earnings to the shareholders as a regular dividend payout. While capital gains are important for building wealth over long periods, some investors – such as retirees – depend on steady income sources to cover their living expenses. Therefore, equities with reliable and preferably rising dividend distributions meet those investor requirements. In addition to the basic financial metrics, like the dividend yield the dividend payout ratio, total returns, etc., a long history of dividend payouts that increase every year is an obvious indicator that a company might continue delivering steady income payouts in the future. However, some financial experts claim that paying steady dividend distributions has no impact on the overall performance of a stock. Alternatively, back-tested history of equity performance indicates that publicly traded companies with solid records of increasing dividend distributions generally experience reduced volatility and deliver above-average total returns. This effect is more pronounced over long-term investment horizons. Clearly, long-term dividend boosts do not drive the performance of a company’s stock. While a long streak of rising dividends might not be the cause of strong performance, long -term rising dividends serve as an indicator of solid company fundamentals. Some companies establish and follow specific dividend policies that mandate the timing and the level of dividend payouts and increases. These policies are non-binding and companies can change them at will and at any time. However, failing to deliver the dividend hikes anticipated by the shareholders could lead to major sell-offs and outflows of capital. Additionally, a company’s commitment to annual dividend hikes and successful execution of that commitment signals to investors that the company has efficient capital management, steady cash flow and a lean cost structure. All of these characteristics are essential for building the type of company that has strong fundamentals and is well positioned to deliver above-average returns to its shareholders. Furthermore, a strong operational performance and efficient capital management also indicate that a company is well-positioned to weather adverse market conditions and still provide capital gains and dividend income distributions. Delivering annual dividend hikes for more than two decades is a good indication that a company can manage political changes, navigate market downturns and recessions, as well as adapt to new technologies and new market conditions. There is no specific reason why 25 years of consecutive annual dividend hikes is the threshold for being designated a Dividend Champion. Even Mr. Fish created two additional categories with significantly lower thresholds. However, 25 years allows enough time to weed out the dividend pretenders. Additionally, that specific cutoff generates a manageable list of companies to research and analyze before selecting the ones that best fit an individual investor’s portfolio strategy. Dividend Kings – a subgroup of Dividend Aristocrats requires at least 50 consecutive years of annual dividend hikes – currently has only 16 companies. While those companies have impressive dividend hikes records, the limited selection might not allow investors enough choices for portfolio diversification. Alternatively, a lower cutoff – such as 10 years – more-than doubles the number of companies from 130 Champions to 330 Challengers and Champions combined. Therefore, while 25 years might be a little arbitrary, that constraint generates a manageable offering of diverse companies with a robust long-term performance for investors. 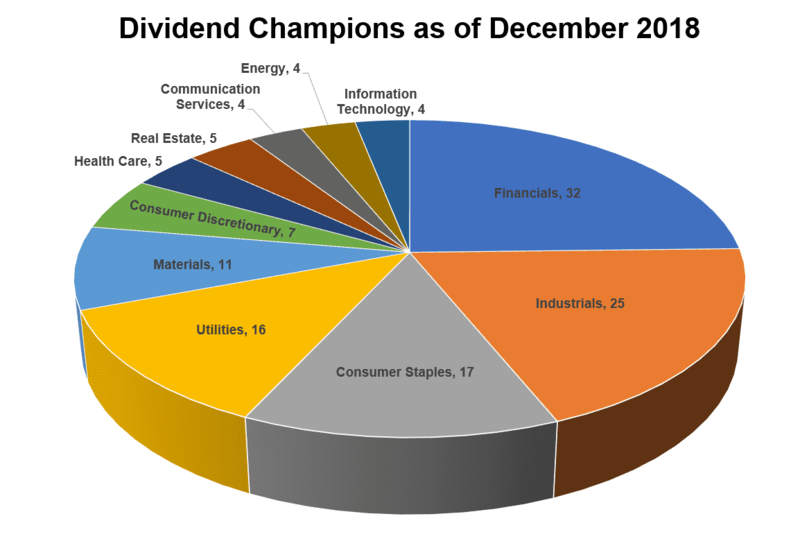 The 130 companies currently in the Dividend Champions list come from 11 different sectors. However, the distributions among sectors differ significantly. Nearly a quarter of companies – 32 out of 130 – are from the Financial sector. Three sectors –Communication Services, Energy and Information Technology (IT) – were represented by just four companies each. Plus, nearly half of the 57 companies, or nearly 44% of the total, come from just two sectors – Financials and Industrials. However, the picture looks different from the market capitalization perspective. While accounting for just 13% of companies, the 17 Consumer Staples firms take nearly 30% of the total market capitalization. Financials – the top sector by company count – manages only a sixth-highest market cap with 6.7%. Alternatively, the four Energy companies manage to grab the fourth-highest market cap share of nearly 13%, while accounting for just a 3.1% share of companies. Furthermore, the companies in the Energy sector have the highest average capitalization of nearly $150 billion per company. With just one more company than the Energy sector, the Health Care sector managed to capture the third-highest capitalization share with nearly 15%. In addition to Energy, the Health Care sector is the only other sector whose average capitalization per company exceeds $100 billion. The table and the chart below provide the complete details by sector. The Dividend Champions list offers investors an easy way for identifying companies with verified records of long-term dividend income enhancements. However, in addition to dividend growth, investors must analyze other financial indicators before choosing to take a long position in any stock. While Dividend Champions, Aristocrats and similar groups might have slightly lower returns, dividend income reliability and reduced volatility are strong positive factors to attract long-term investors.